There are brain circuits that anticipate gain and loss, as well as product preference and price computation. Using neuroimaging devices, researchers are now able to characterize the consumer decision making process in certain conditions. Whether your product, packaging or ad stimulates a gain or loss feeling in your customer’s mind, or if they engage positive or negative feelings? Does your customer pay any attention to your ad? Find out how you can answer any of these questions using neuromarketing research, a powerful approach that identifies and clarifies the neuropsychological components that influence purchasing decisions, but also aims to understand consumer behavior in different situations. A popular saying of John Wanamaker illustrates how difficult it is to reach potential customers using traditional advertising: “Half the money I spend on advertising is wasted; the trouble is I don’t know which half.”. The decision of whether to buy or not a product is fundamental for economic analysis. Economic theories state that purchase decisions are driven by the calculated utility, according to preferences and price. But neuroscience studies suggest that there are brain circuits that anticipate gain and loss, as well as product preference and price computation. So using neuroimaging devices, researchers are now able to characterize the consumer decision making process in certain conditions. Want to know whether your customer identifies the gain in buying your product? Anticipation of financial gains activates the area called nucleus accumbens and correlates with self-reported positive arousal, whereas gain outcomes activate the medial prefrontal cortex [as mentioned in Knutson B., Fong G. W., Adams C.M., Varner J. L., and Hommer D. (2001). Dissociation of reward anticipation and outcome with event related FMRI. Neuroreport 12: 3683–3687]. But what if your advertising campaign, packaging design or price stimulates the feeling of loss in your consumer’s mind? Activation of the brain area called insula correlates with self-reported negative arousal, so, insula activation has been hypothesized to play a critical role in loss prediction [Paulus M. P., Stein M. B. (2006). An insular view of anxiety. Biol. Psychiatry 60: 383–387]. How does your pricing affect product preference? Research found that activation in regions associated with anticipating gain (nucleus accumbens) correlates with product preference, while activation in regions associated with anticipating loss (insula) correlates with excessive prices [Knutson B., Rick S., Wimmer G. E., Prelec D., Loewenstein G. (2007) Neural predictors of purchases. Neuron 53: 147–156]. During experiments that used images of products with prices as stimuli, nucleus accumbens and medial prefrontal cortex showed increased activation prior to purchasing, while insula showed decreased activation prior to purchasing. How does my product rank in the mind of the consumers, after they see it for the first time? A team of researchers measured neural activations in predefined brain areas while subjects viewed 20 different goods inside an fMRI scanner, without knowing that they will have to make choices afterwards. 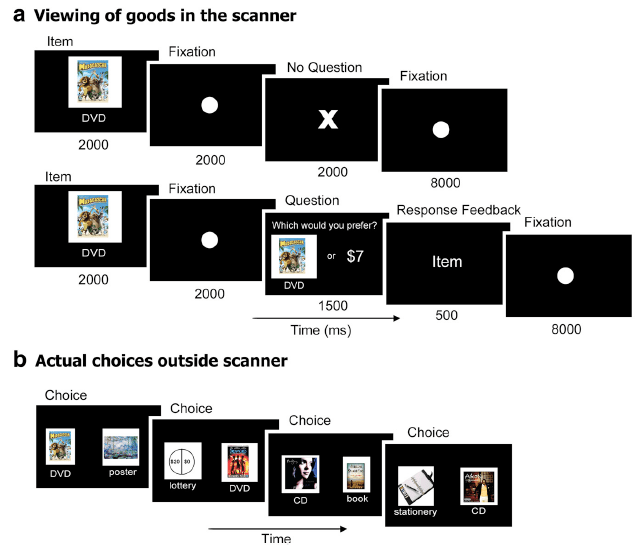 Results state that the activity in the medial prefrontal cortex and in the striatum, areas associated with value representations, can be used to predict later consumer choices in individual subjects [Levy I., Lazzaro S. C., Rutledge R. B., Glimcher P. W. (2011) Choice from non-choice: predicting consumer preferences from blood oxygenation level-dependent signals obtained during passive viewing. The Journal of Neuroscience 31(1): 118 –125]. Does your product, packaging design, movie or ad stimulate positive or negative feelings? Resting asymmetry recorded from the frontal region can predict affective responses to stimuli (and the valence of the responses). Increased relative left hemisphere (frontal area) activation is associated with greater positive affect in response to stimuli, while increased relative right frontal activation (and decreased left frontal activation) is associated with greater negative affective responses. [Davidson R. J., Ekman P., Saron C. D., Senulis J. A., Friesen W. V. (1990) Approach-Withdrawal and cerebral asymmetry: Emotional Expression and Brain Physiology I. Journal of Personality and Social Psychology 58(2): 330-341]. So increased relative right frontal activation is associated with withdrawal reactions, and increased relative left frontal activation is associated with approach reactions. Several emotion theorists have stated that fear and disgust are the two negative emotions that are most reliably associated with behavioral withdrawal [Ekman E., Friesen W. V. (1975) Unmasking the face: A guide to recognizing emotions from facial clues. Englewood Cliffs, NJ: Prentice-Hail; Plutchik R. (1984) Emotions: A general psyehoevolutionary theory. In Scherer K. R., Ekman E. (Eds.) Approaches to emotion (pp. 197-219). Hillsdale, NJ: Erlbaum]. Does the customer pay attention to my ad? In 1898, the first formal advertising model, AIDA (Attention – Interest – Desire – Action), positioned attention as the first step that people go through when exposed to advertising and before making a purchase [Vakratsas D., Ambler T. (1999) How advertising works: what do we really know? Journal of Marketing 63(1): 26–43]. One method of measuring attention in marketing is using eye-tracking technology, where eye movements are recorded to indicate individuals’ attentional patterns. What moments of an ad get stuck in the memory of the consumer? If relevant information in an advertisement does not enter long-term memory, the advertisement cannot be effective. Neuromarketing research can now identify the moments of an ad that are memorized and which moments are not. It was found that video scenes that elicited the fastest brain activity in the left frontal hemisphere are also better recognized afterwards. This finding suggests that the transfer of visual information from short-term memory to long-term memory takes place in the left hemisphere. Also, selection of visual content that produces a fast electrical response in the left-brain hemisphere should help to create highly memorable TV commercials [Rossiter J. R., Silberstein R. (2001) Brain-imaging detection of visual scene encoding in long-term memory for TV commercials. Journal of Advertising Research, March-April 2001]. The findings in neuroeconomic research illustrate the power of this approach to identify and clarify the neuropsychological components that influence purchasing decisions, but also to understand consumer behavior in certain situations.